Since 2005, the K.N.P.S.V. is enriched with a fantastic sorority. 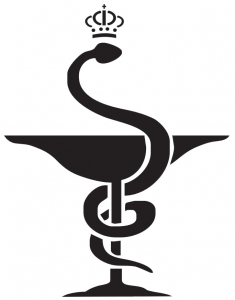 That is the year the pharmaceutical sorority “Hygeia” was founded! During the annual K.N.P.S.V.-congress new girls from different cities are asked to join the sorority. This tradition has ensured us with 46 enthusiastic members from Groningen, Leiden and Utrecht. At ‘Hygeia’, coziness and having a good time is important. We have dinners every month with each other and usually end the evening with a few drinks in one of the three cities. We can always be found at the gala of one of the departments equipped with a traditional pink gadget. We can also be found at activities of the K.N.P.S.V. and can’t be missed in our pink merchandise. Don’t hesitate to ask us any question or show interest in our cozy sorority! A highlight of ‘Hygeia’ are the spring and fall weekends, where a large group of the ladies go to a small city for a weekend. 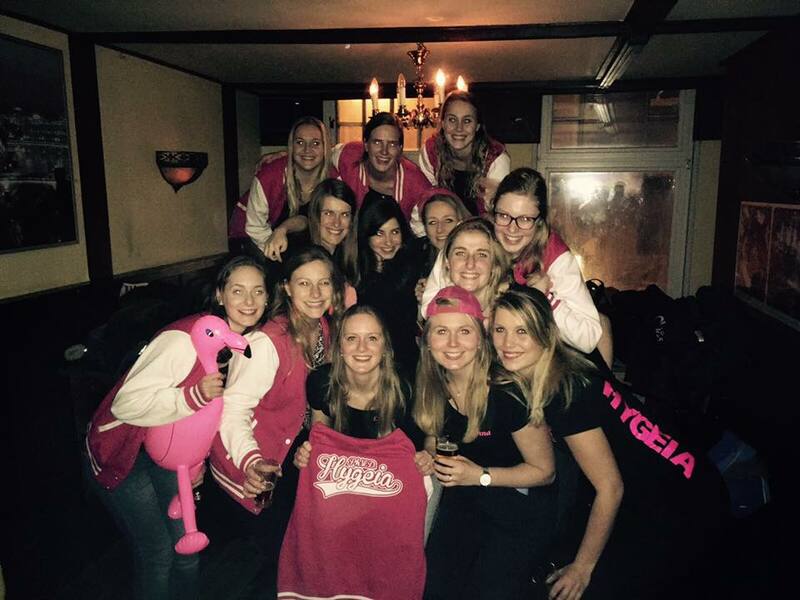 Sportive activities, relaxing and going out: it’s all possible during a ‘Hygeia’-weekend! We celebrated our second lustrum in 2015 and went to Belgium for a long weekend, followed by a trip to Rhodos in the summer. We also organized a fantastic gala with L.P.H.D. ‘Don Durk’ for all K.N.P.S.V. members. Besides our common activities like the dinners and weekend trips, we also organize varying activities like a mother-daughter day, a cycling dinner and the latest class of members organize a fun activity in the summer. In other words, ‘Hygeia’ stands for a lot of fun and doing fun stuff together. We don’t want to keep this fantastic environment for ourselves, so we annually organize an activity around January/February that all K.N.P.S.V. members can attend. The past years it has been a karaoke night, what has proven to be a success. We hope to see you soon at K.N.P.S.V. activities, one of the galas and of course at our own ‘Hygeia’ activity! 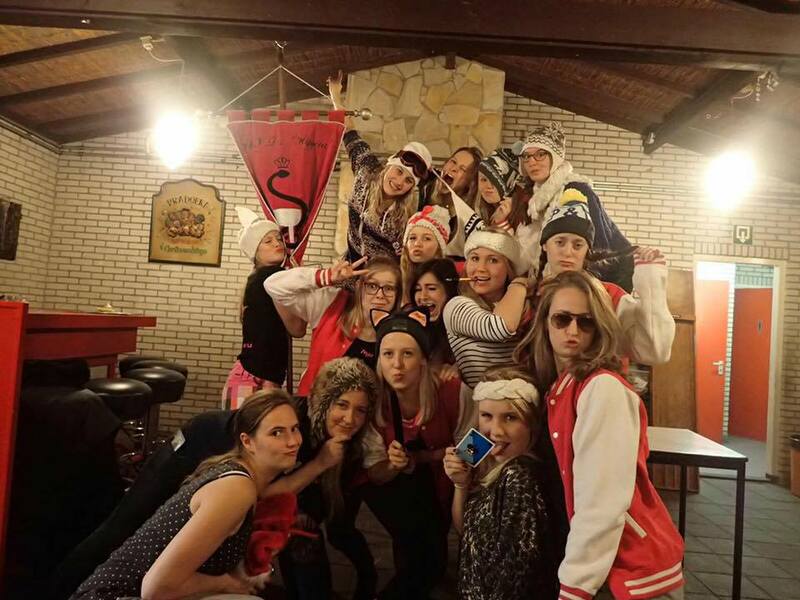 Annemoon, Anniek, Anita, Anne R., Anne vS., Anouk, Bianka, Charlotte, Chiara, Debbie, Denise, Elien, Elvira, Emily, Emy, Eva, Evelien, Evianne, Fatima, Fieke, Fleur, Hanne, Imke, Inge R., Inge tS., Iris B., Iris V., Isabel, Janine, Janna, Kim, Kimberly, Laura, Léonie, Lieke, Lisanne, Lissa, Marrit, Merel, Mieke, Renée, Rixt, Sonja, Tanja, Tessa H. en Tessa dK. !